Greg Ellwand’s Bread! is part of Toronto Fringe Festival. Greg’s bread is baking at Annex Theatre, and it is delicious. You could do worse than standing in line to get some. Just saying. Greg is a great entertainer. He sings and he dances and he educates. He knows his bread. He’s a rare breed too. Greg makes Twitter jokes while talking about ancient grains. He also sings and dances. Greg is a person you want as a real life friend. Dan Imbrogno provides the sound and accents to Greg’s dancing. Dan is a one man band and also a great friend of Greg. Dan and Greg are a great pair with lots of chemistry. Greg is pretty incredible. He tells us the history of bread. It’s part history/baking/health/political lesson. Oh, he can sing and dance too! Imagine Danny Kaye meets David Byrne. Now those are some ingredients for some tasty bread. There’s incredibly terrific songs composed of incredibly bad bread puns. They are all incredibly delicious. These are the ingredients that rise though and end up being hugely entertaining. The play is great. I suppose the message is that bread is life, and that in this modern world, bread has somehow become the enemy. While mostly a song and dance routine, the play is sweeter than you can imagine. Greg singing with his daughter is magical. Ellie Ellwand will make your eyes water, trust me. Bring tissues. Bread! brings generations together and raises awareness. It educates and entertains us. It reminds us of our grandparents. It’s that smell of something baking in an antique oven. Is there anything better? Buried beneath all the fun, yet inherent in the play are some sad truths. Bread is great. North America could produce enough to feed the world. We’d be proud to do so. Our governments build damns to flood half of Washington state and pay farmers not to grow food. Bizarre. It’s incredible how great Greg and Ellie work together. I didn’t think families like this existed anymore. Seeing those two performing together was like hanging out with my retired friend Stan and his daughter. I thought those days were over. I’m glad they are not! 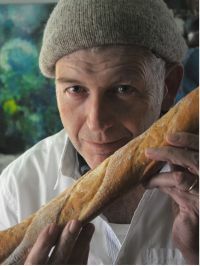 Anyway, I strongly recommend Greg Ellwand’s Bread. You will laugh, you will cry, you will clap along. Greg is something special. So is his family. Go see the show. Otherwise you get no bread! I saw this show on Saturday night (July 7) and was utterly charmed by the charismatic and endearing Greg Ellwand – he dolf the slim concept of “Bread” on the force of hid personality (assisted by Dan Imbrogno and Ellie Ellwand). Greg sings and dances (who knew? ), and the father/daughter harmonies he and Ellie demonstrate are just lovely. “Bread” incorporates history lesson, family memories, and some beautiful poignant moments. I enjoyed it, and came away really wanting to bake bread! There should be a recipe for the bread that Greg talks about so lovingly (no yeast or milk or eggs, just flour, salt and water) inserted in the program! Sorry – typos above. Should read “he sold the slim concept…” and “force of his personality”.